Let me shed some light on the document above. The bold, italicized paragraphs below are from the ARBCA document. My comments and evidence follow each of the bold paragraphs. This three-member panel consisted of Mike McKnight, Pastor Tedd Tripp, and Pastor Richard Jensen. 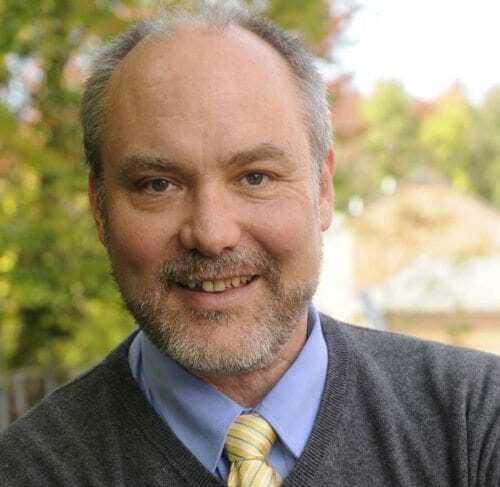 Pastor Richard Jensen is the pastor of Hope Reformed Baptist Church in Long Island, NY. 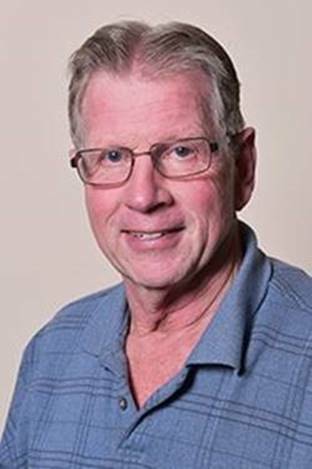 Prior to serving as a pastor, Jensen was a homicide detective. In response to this, let me simply quote Pastor Jeff Crippen. He withdrew his church from the corrupt ARBCA denomination. Let me also add this audio to further expose the ARBCA cover-up. 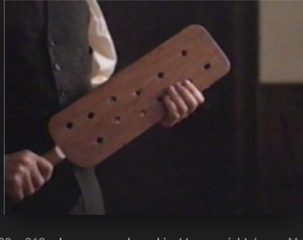 This is a conversation between Anthony Battaglia and a detective in the Prescott Police Department. Battaglia used to be a deacon in an ARBCA church in Clinton, LA. He was determined to find the truth and then let others know about the corruption within the ARBCA. 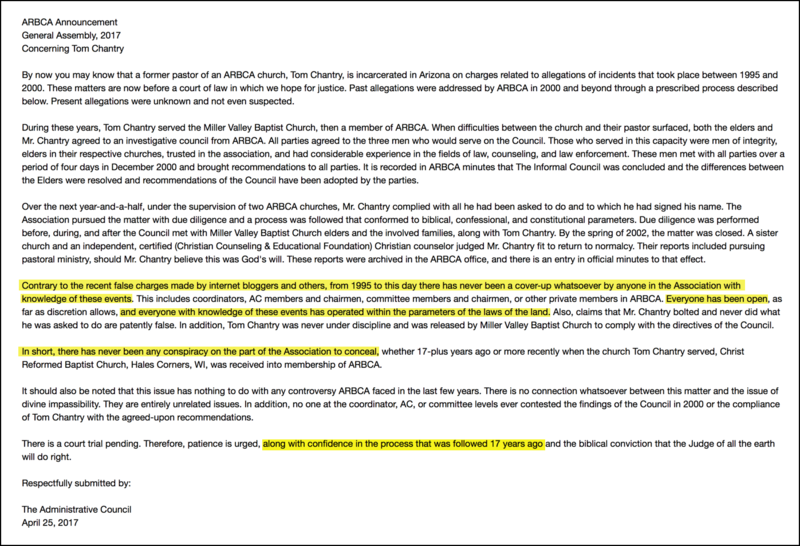 After he posted information on his website ( ARBCA.org) church leadership “severed” him from membership! I would encourage any and all to contact leadership in the ARBCA and demand the truth. (Members of ARBCA churches especially need to take action.) Corrupt leaders need to be removed. 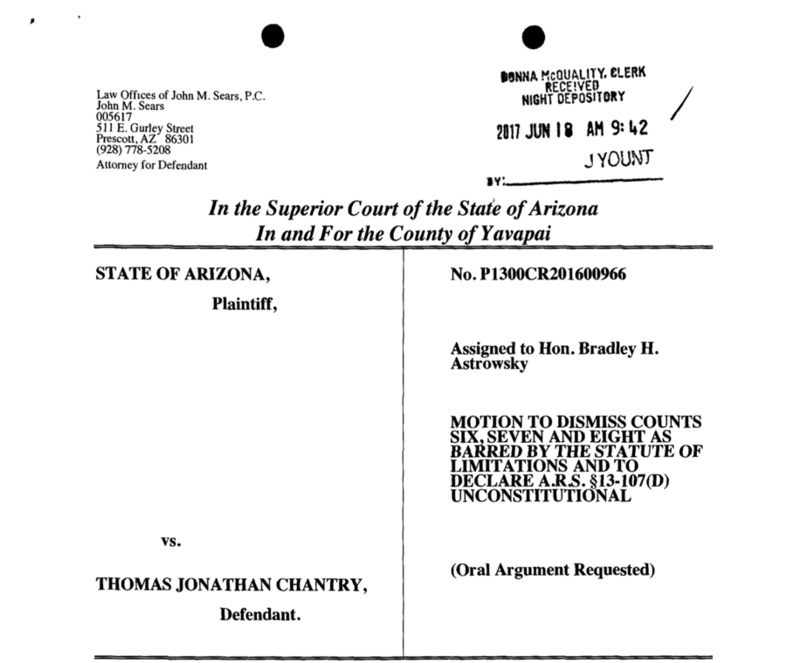 I will let you in on a little secret – the ARBCA will, at some point, be facing civil lawsuits by people who have been victimized by Thomas Chantry. In my opinion, the lawsuits will be easily won. The ARBCA is a relatively small association of churches and likely will face financial ruin unless good folks in the pews take action. 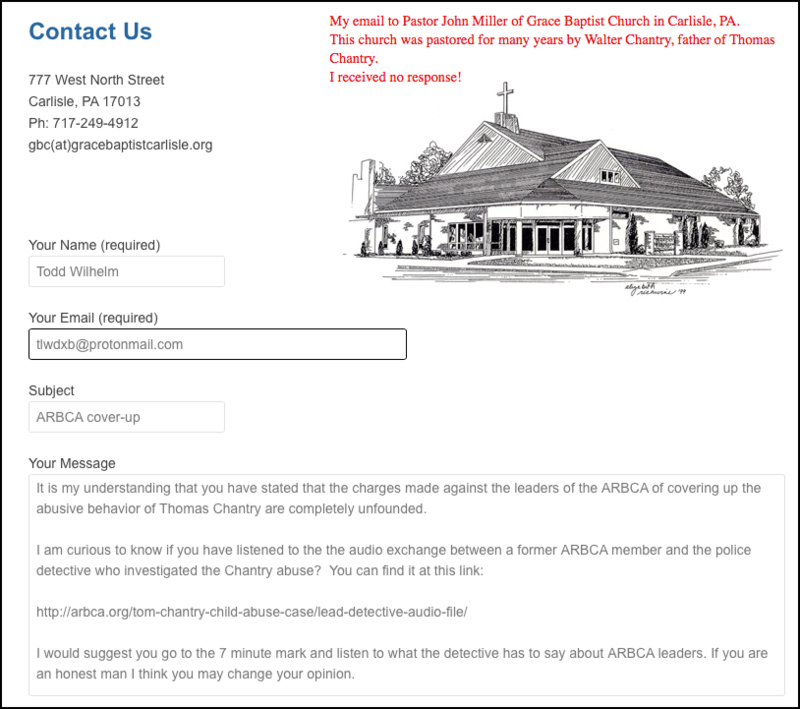 I sent the email below to Pastor John Miller. 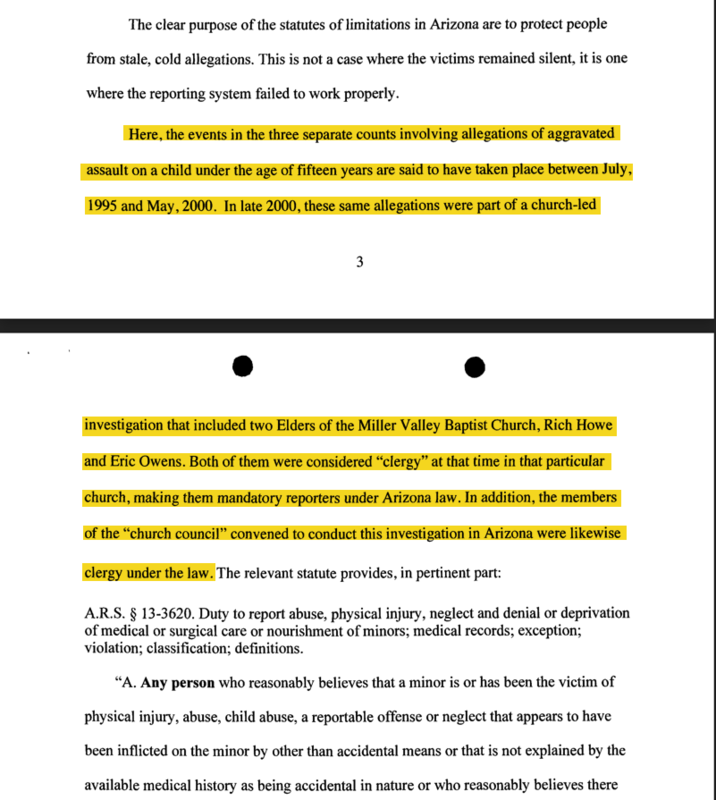 He never responded to me and likely never investigated my claim nor told anyone in his congregation the truth. Just wanted to say thanks Todd for taking the time to do this. From someone who spent two thirds of my life in the Valley of the Sun, I know how far away Camp Verde is from every place most people live. We need more people who care about justice in The Church. In our modern society that word that the very foundation of God’s throne is founded on has largely been thrown away in favor of a liberal do whatever you want and whatever you can get away with mentality. There is as much of it in The Church as anywhere else. We have lost the fear of God and a great time of judgment is coming on The Church. Both legalism and lawlessness will take the blows. I was in a sgm church and ask twice to listen to a sermon from a particular sgm pastor who had recently abandoned his flock. (Let’s theoretically refer to said pastor as CJ) After refusing for a second time to listen to him, me and my family experienced the wonderful Christian principle of being shunned. We put up with that for a few months and then left. After 13 years of service to that church and having taught every pastor’s child or grandchild in Sunday school not a single pastor said anything to us when we left. Very sad Charlie, but unfortunately shunning is a common procedure with these types of churches. I have experienced it at both an SGM church and UCCD, the Capitol Hill Baptist clone in Dubai. Ps Jeff Crippen’ comment is spot on. The church Jeff pastors used to be a member of ARBCA but it left the ARBCA association some years ago because of how the heavy-weights at ARBCA were gnat straining over very a abstruse doctrine (Divine Impassibility) and were claiming that unless you concurred with that doctrine, you were not really a Christian. The Tom Chantry scandal was going on under the scene at that stage, and later it came to light. Wherever there is an imbalanced emphasis on certain doctrines , you will also find there is immorality, especially sexual immorality, going on. I’m not saying which is the chicken and which is the egg, but they usually co-occur. People who abuse others, and people who cunningly cover up for abusers, are equally guilty. Thanks, Barbara, for the great comment. I would point out that while I am not a lawyer, I think, based on what I’ve researched, that a case for obstructing justice could be brought against the relevant ARBCA leaders and pastors who covered for Chantry, in the United States. Simply not reporting private confessions of abuse, given in a confessional setting, seems to be considered a relatively minor crime. By contrast, conspiring with others to keep families or the police from knowing about allegations of sexual abuse, regarding children, is a major crime as it undermines the legal system by obstructing justice. I hope that ARBCA leaders are charged with conspiring to obstruct justice. There are no extenuating circumstances for what these ARBCA leaders did. They were just protecting a fellow pastor at the expense of letting children be molested and beaten, in my opinion. They can argue about doctrinal issues in prison. I, too, hope that ARBCA leaders are charged with conspiring to obstruct justice. What makes it even more reprehensible is this: it seems like nepotism was going on. 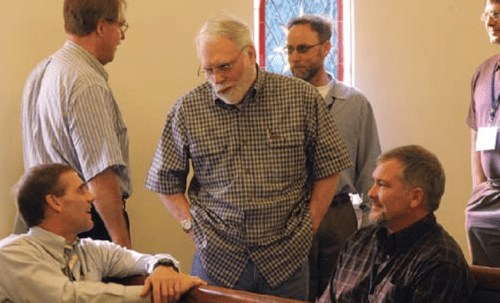 I am guessing that Walter Chantry, who seems to be seen as the most venerable and influential leader in ARBCA, pressured Mike McKnight the elder in his church. And Mike and the other two members of the investigative committee would have caved under the pressure. Cowards all of them. Base cowards. Men who feared men more than they feared God. If they don’t come clean — and that publicly — before they die, the Lord will cast them into outer darkness. Thanks for your comment, Barbara. 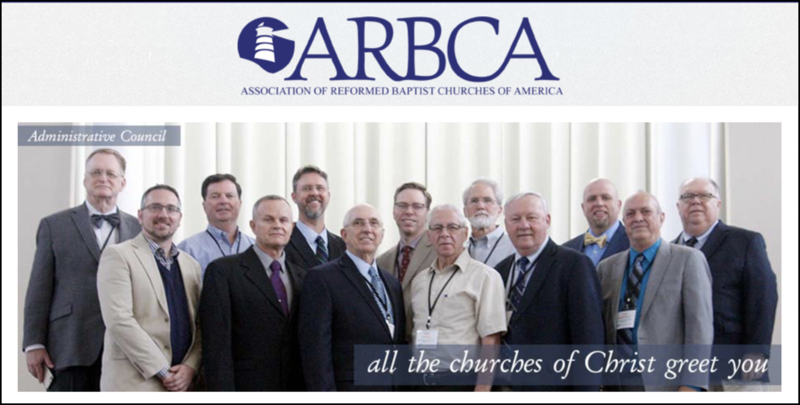 In my opinion, the ARBCA leaders are the modern-day equivalent of the scribes and Pharisees of Jesus’ day. I guess I should not paint with a broad brush; I am sure there are some upright and faithful men in the ARBCA, but there is a corrupt core who have been in power for years and those are the ones I speak of. That said, I do wonder why the upright and faithful have not followed Jeff Crippen and Miller Valley Baptist Church’s examples and left the denomination. I do wonder why the upright and faithful have not followed Jeff Crippen and Miller Valley Baptist Church’s examples and left the denomination. So, wait… let me see if I understand this. A little over a year ago, in an attempt to have certain charges dismissed, Chantry’s lawyer essentially argued that the three elders in question broke the law, and that the ARBCA lied in their public statement offered just a few months before. And apparently, Chantry is OK with this. What exactly is going on here? 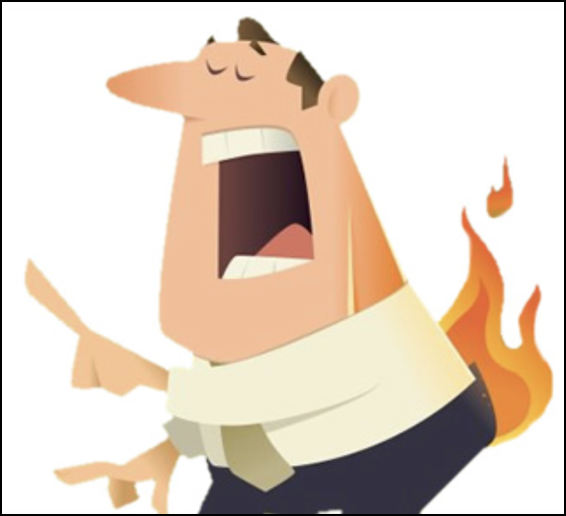 Did Chantry throw the ARBCA and his own colleagues under the bus, hoping to save his own skin? Or was this part another reason why this bunch covered up his alleged crimes in the first place? Not just to preserve the ARBCA’s reputation, but to force statute of limitations just in case Chantry was ever brought to trial? Thanks for the comment. I haven’t looked at the legal document in question in depth. However, I’m guessing that the answer is your former supposition. Chantry is being represented by a top-notch, experienced lawyer. Going after ARBCA in an attempt to have certain charges dismissed, on a technicality, was probably his idea. I suspect that Chantry has no problem throwing anyone under the bus in order to avoid going to prison as a convicted child molester or child beater. Certainly, no one made the leaders of ARBCA cover for Chantry in such a despicable manner. They have some explaining to do. 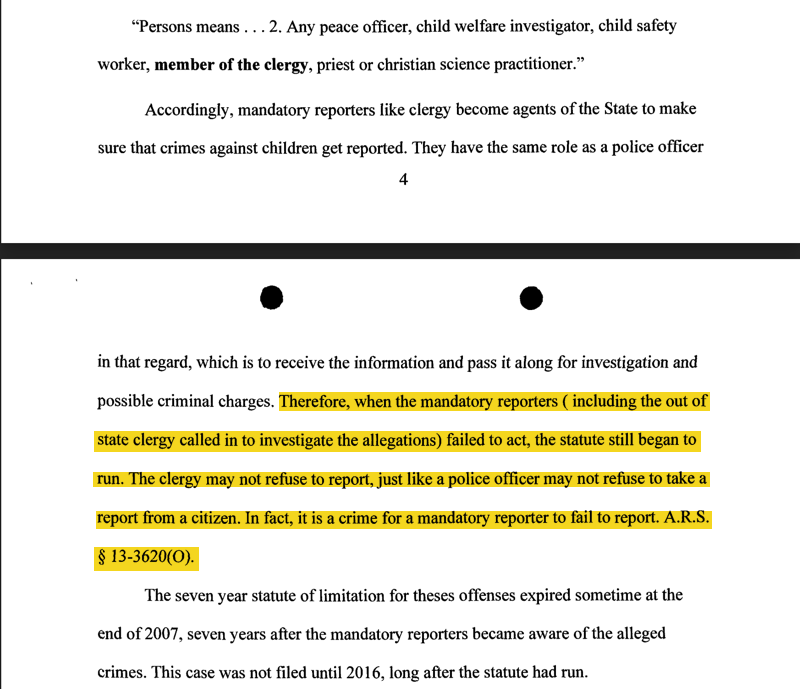 Best case outcome would be charges brought against all who failed to report, and the expulsion of those in ARBCA hierarchy who covered up for Chantry. Long ago, behind a disguise of sheep’s clothing, men crept in as Jude warns us to watch for. Oh how saintly and godly they can seem. Preach sermons. Pray long prayers. Teach sound doctrine. And yet all along they are the hypocrites Jesus exposed for us to watch out for. If you doubt it, just tell them they are wrong about something, or just say “no” to them and the fangs come out. Most probably what needs to happen is for ARBCA as an entity to go away completely, true Christians and churches learn wisdom from all this, and the guilty to contemplate their evils behind bars. Thanks for commenting Jeff. I can think of no other individual more qualified than you to comment on the ARBCA. I heard Tedd Tripp speak at a Sovereign Grace church in Chesapeake VA years ago – probably 1999. How can a man who teaches how to shepherd a child’s heart, ignore/fail to report the abuse of a child/children? Those poor children will likely have permanent scars and anyone who knew and failed to report is complicit in causing harm. Good to see you, Julie Anne. 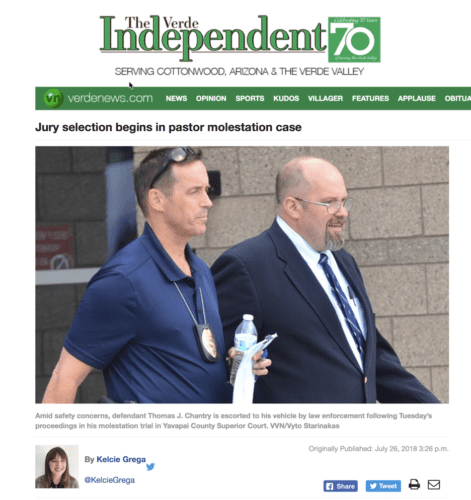 In my view, the people/pastors/leaders who covered up allegations of abuse against Tom Chantry should be permanently barred from ever having leadership positions in any church again. I believe in giving people second chances for most things. Egregiously enabling child abuse, on an institutional level, is not one of them. Great question Julie; a question for which I have no answer. I would be very interested in hearing what Tedd Tripp’s response would be. Perhaps someone attending one of his upcoming seminars can ask him that question and get back to us!